Following on the heals of Drew Weaver's critically aclaimed "Unfaithful Kind" CD, this release steps back into his roots a bit, leaning on the entertaining sounds of his post Surf Piranhas band the Vibrabeams. In fact, three of these tracks were cut in Paris with the reunited Vibrabeams. The rest are from Drew's Delaware based version of the Alvarados. This fine CD includes Drew's amazing vocal cut of "Misirlou." The musicians here include Drew Weaver (El Caminos / Surf Piranhas / Vibrabeams) - guitar, vocals, Frederic Cormier - guitar, Buck Rock - bass, Mark Foulsham - organ, and Brad Fish - drums). True western feel, slightly moody, somewhat spaghetti western, and very chunky. The melody is the sort of thing you find yourself humming later, not sure what it is. Excellent guitar work from Drew Weaver and a very solid backtrack. This is a splendid interpretation of the theme from a short lived sixties TV western called "Black Saddle." The only other version I know of is from the Revelairs (Rare Surf Vol. 2). This familiar island beauty of the fifties finds new life in this ultra suave recording. Dramatic, and fluid. The vibrato guitar shimmers as the misty clear water laps at the shore. They even went so far as to include the chorus for that letter perfect period feel. Its' enhanced with Drew's narrated introduction. Magnificent! 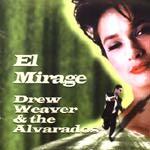 Drew narrates a haunted intro to this epic tale of searching for real love, but often finding only "El Mirage." Slow, suave, chorus enhanced, with twang delivered via the vibrato lead. Very cool. Recorded in 1997 in Paris with a reunited Vibrabeams. Out at 4:33 in track 15 we find a slow and dangerous ode to the "Undersea Dominance." I'm guessing at the title. Throbbing guitar, haunted distant chorus, and a moody guitar line make up this undersea adventure. It eventually gathers speed before leaving the depths behind. It's like a musical-narrated version of Sea Quest. Very pretty, and the narration is perfectly brooding.